The theme for this month's Foodie Extravaganza is Caramel. 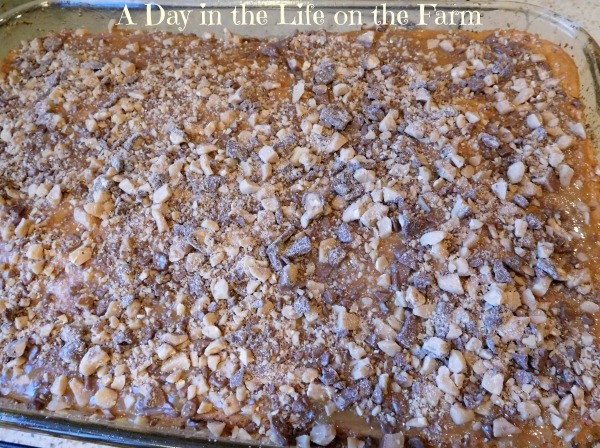 All the members of the group made a recipe featuring caramel and are sharing it with our readers today. You will find links to all the recipes at the bottom of this post. You can learn more about the group at our Facebook page. This month's party is being hosted by Kathleen of Fearlessly Creative Mammas. She went over to The Nibble where she found out all about the foods that Americans celebrate during the month of April. Today, April 5th, is National Caramel Day. Woohooooo. And tomorrow? Tomorrow is National Caramel Popcorn Day. So there you have it folks. Time to break out the caramel!! Our German son, Max, was home for a few days. He was able to squeeze in a short visit between a training session in New York and returning to Berlin. Since he only had a few days we hosted a party so that everyone could come to him instead of his trying to be everywhere at once. I made up a roaster full of stew, a big tossed salad, a fruit salad, biscuits, brownies and this absolutely amazing cake that I adapted from this recipe found at BettyCrocker.com. 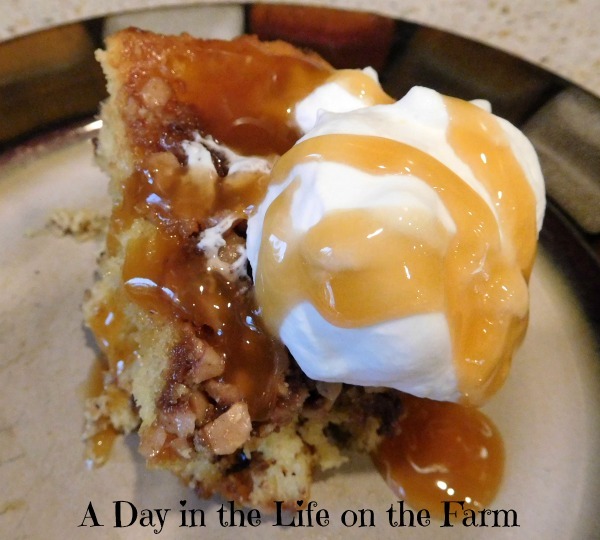 Starting with a boxed cake mix, heath bar crumbles and salted caramel ice cream topping made this cake come together in minutes. A quick bake in the oven, top it with more salted caramel and toffee candy pieces and it is ready to be set aside while you complete your other chores before guests arrive. When ready to serve, just whip up some heavy cream and drizzle with some more caramel and you have a treat sure to please any caramel lover in your midst. 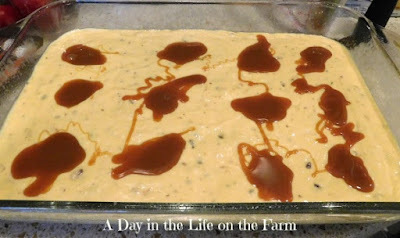 Make sure you continue after my recipe to see all the other Caramel Creations! Place cake mix, flour, water, oil and eggs in large bowl of stand mixer fitted with paddle attachment. Mix on low for 30 seconds, increase speed to medium and beat for a minute or two. Stir in 1/2 cup of the toffee bits. Pour into a 9x13" pan that has been treated with baking spray. Reserve 1/2 cup of the salted caramel. Drop by spoonfuls the remaining salted caramel in dollops on top of the batter. Bake in a preheated 350* oven for 35-40 minutes, until a skewer inserted removes cleanly. Cool cake for 5 minutes. Place the reserved salted caramel in the microwave on high heat for 10 seconds then pour over the still warm cake and spread it evenly. Sprinkle with remaining toffee bits. Just before serving, place the heavy cream in a chilled bowl of your stand mixer fitted with the whisk attachment. Begin beating on low until slightly thickened. Increase the speed and beat until light and fluffy. No need to add any sweetener to this cream. This cake is plenty sweet. 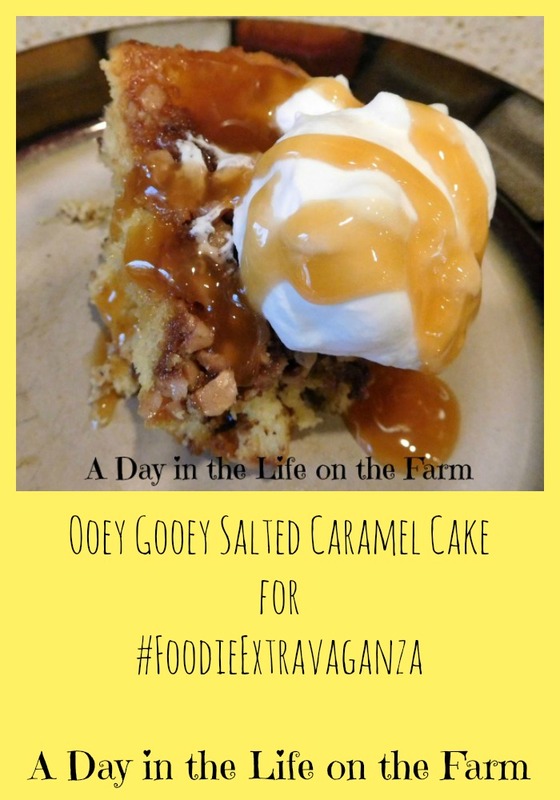 Foodie Extravaganza is a monthly party where bloggers come together to create recipes using the same ingredient. The host, this month it's Kathleen from Fearlessly Creative Mammas, picks an ingredient from the website The Nibble. If you're a blogger and would like to join in the fun, you can request to join on this Facebook page. Posting day is alway the first Wednesday of the month. If you'd like to see past recipes, you can follow our Pinterest board too. Oh wow! I love all of those flavors. I bet the texture is incredible. 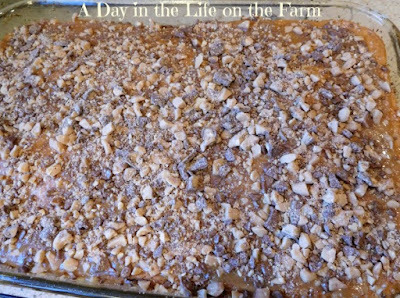 I think this would make a great dessert to bring for a potluck- I am pinning to use it later! Perfect dessert .. love the combo of caramel cake with ice cream. OMG! What more can I say?